Overcast — the popular podcast app by Marco Arment was updated to version 3.1 this week, which introduces two interesting features to the app — Standalone Apple Watch Playback and also a Custom Dark Icon for Premium Subscribers. 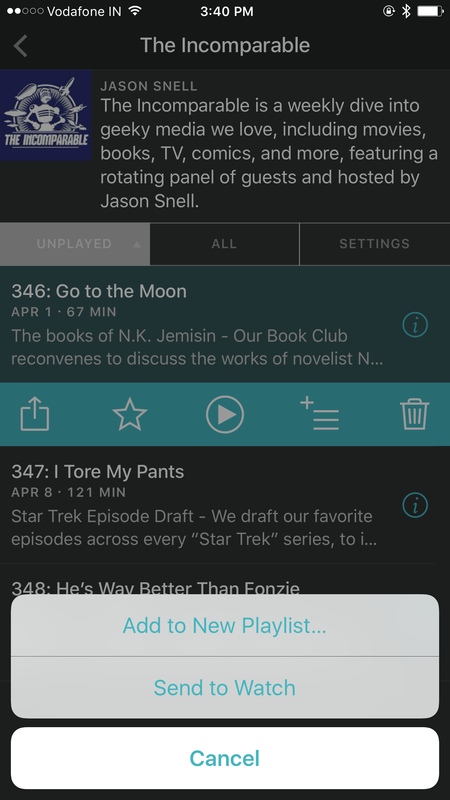 This feature lets users load podcast episodes (pods?) directly onto their Apple Watch. You need to have the Overcast app installed on your watch, after which you’ll see a new ‘Send to Watch’ option upon tapping the ⁺≡ queue button. Unfortunately, the transfer takes a while to show up on the watch, especially if the episodes are longer. With this feature, you can now listen to your favorite podcasts on your Apple Watch without the need to have your phone with you, especially when you’re out on a run. Of course, you need to have bluetooth earphones that work with your Apple Watch to actually listen to the podcasts. iOS 10.3 introduced the ability for apps to offer custom icons to users, which can be changed by the user any time. 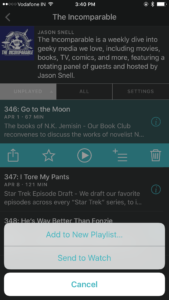 Overcast 3.1 includes a special dark icon that’s available to premium users only. Overcast 3.1 is available for Free on the App Store. A subscription to Overcast Premium costs $9.99 per year.